I was never one for goodbyes. It just feels so definite. It makes me think of... the End. I don't like the idea of good things ending. I prefer to think of it as moving forward. Focus on the newness. The idea of never seeing someone again - someone who I connect with - makes me sad, frankly. People and relationships are what make us human. But honestly, if we really get each other, we will see each other again. Period. I have friends all over the world - friends I've made through academia, work and travel - and I am happy to say we've managed to reconnect on many occasions. It's up to y-o-u to make it happen. Sometimes I'm just no good at saying goodbye, but I am good at making chocolate. So, I give chocolate. Making chocolates requires patience and a delicate touch. It says "I think you're alright". There are different components, different textures, different heating and cooling stages and precision. It requires time. And what better gift to give to someone than your time. The kicker is the dipping and setting. You need to temper chocolate (GAH!). Tempering is called just that because it can test your temper. Be patient, take time. It is essentially a controlled method of cocoa butter crystallization (super scientific, but super achievable). When giving chocolates, the whole quality vs. quantity thing doesn't apply. You need BOTH. The number of chocolates you receive is directly proportional to how much I like you. (Realize that it is hard for me to share chocolate). So, if you are going to go the mile of making these, you might as well make a lot! You can easily double or triple this batch. Let's talk about tempering. You can do it in several different ways. The most meticulous involves a series of heating and cooling stages. The aim is to promote the crystallization of one type of fat crystal (yes, fat forms crystals - you can actually see the alignment if you melt butter very, very slowly) - that crystal is called Form V (five). This form gives you shine and snap and the best melting profile. Form IV will be chalky and Form VI is one of the reasons for that white powdery stuff (bloom). When working with dark chocolate (I used 70% for the coating), it involves heating to 45°C/113°F, cooling to 27°C/81°F and then reheating to 32°C/90°F. This is the temperature at which you work with it. Without the right tools, this method of tempering requires a lot of stirring and all of your patience. I do it another way that gives good results with a lot less fuss when I'm short on time and space. 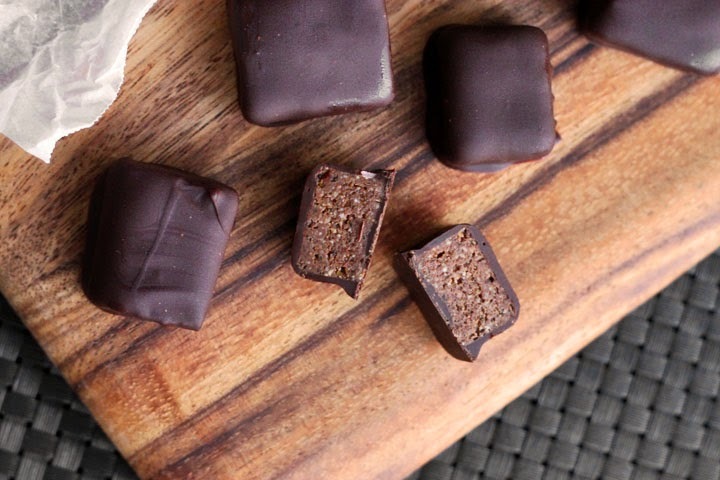 This method involves seeding the chocolate and you only have to melt it once! The trick is never ever heating the chocolate above working temperature. If you do, you will have to start again with new chocolate. To do this, first chop the chocolate very finely so that it melts quicker (smaller = larger surface area = faster melting). Place about 2/3 of your chocolate in a heatproof bowl and set it over a saucepan of simmering water. Turn off the heat under the saucepan and stir the chocolate constantly. Once most of it is melted, remove the bowl from over the heat and continue stirring until all of the chocolate is melted. Then add in the remaining chocolate and continue stirring. If it is too thick, return it over the heat but ensure it does not go over 32 degrees C.
Of course, you have to do this with already tempered chocolate. Do not use your Easter bunny from 2 years ago. Get some fresh stuff. When I offered these chocolates in lieu of goodbye's, I also sprinkled them with a touch of pink sea salt just before they set. I highly recommend this - it really makes the chocolate pop and offsets the sweetness of the filling. Cheers to life, learning, good food and newness! Preheat your oven to 325°F/165°C. Place almonds on baking tray and roast for 10 minutes until they are fragrant and toasted. Transfer tray to a wire rack and let cool completely. Place sugar in heavy-based saucepan with a tablespoon of water and heat over medium-high heat until it forms a dark caramel, swirling the pan frequently for even caramelization. Brush the sides of the pan down with water using a pastry brush as necessary to dissolve any crystals that form on the sides. Once the caramel is a nice dark amber colour, remove from heat and immediately stir in the toasted almonds and salt and turn onto a lined baking sheet. Let cool completely in a cool dry place, at least 2 hours. Once completely cooled, break the praline into smaller pieces and blend in processor into a very fine powder, scraping around he bowl frequently; set aside. Melt milk chocolate and bittersweet chocolate very gently in a heatproof bowl set over a saucepan of simmering water. Remove from heat and stir in ground praline, mixing to a smooth, thick paste. Spread mixture into a lined 22x11cm loaf pan and refrigerate until set. 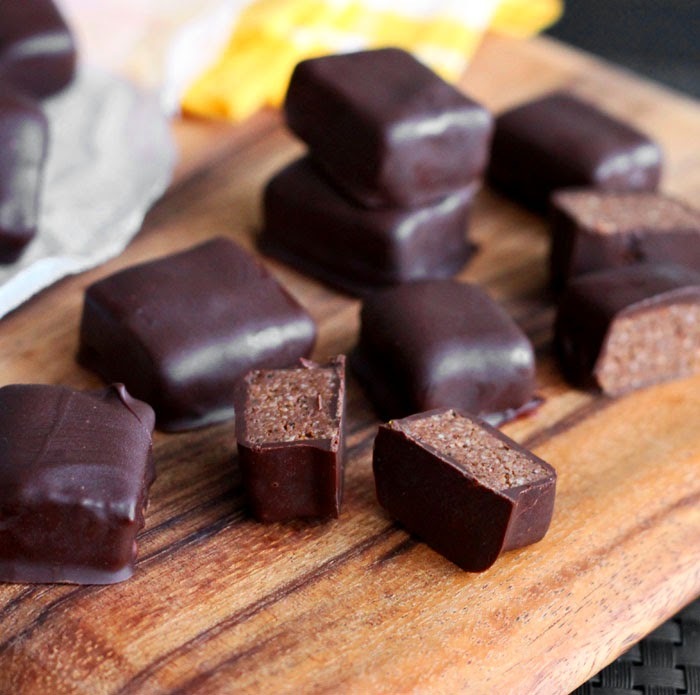 Once set, cut into squares and keep refrigerated while you temper the chocolate. To temper chocolate, first chop it up very finely and place about two-thirds of it in a heatproof bowl and set it over a saucepan of simmering water. Turn off the heat under the saucepan and stir the chocolate constantly. Once most of it is melted, remove the bowl from over the heat and continue stirring until all of the chocolate is melted. Then add in the remaining chopped chocolate and continue stirring. If it is too thick, return it over the heat but ensure it does not go over 32°C/90°F. 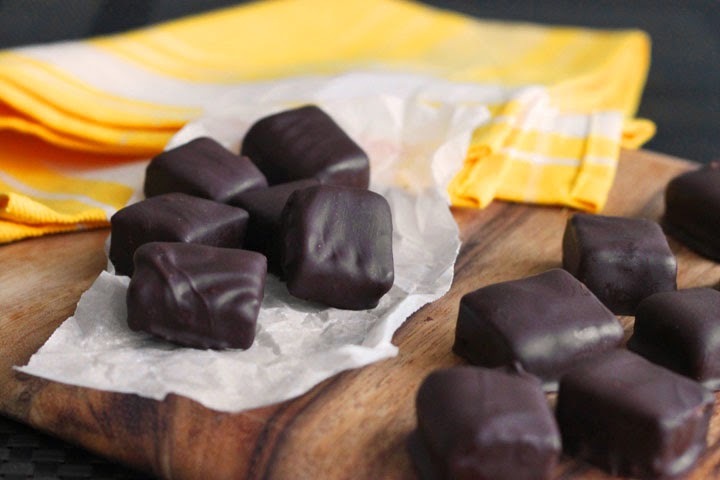 Using two forks, begin dipping your squares into the tempered chocolate and placing on a tray lined with parchment paper to set. If chocolate gets to thick to work with, return it to the saucepan of simmering water and bring it back up to working temperature (you may need to do this several times during the process). 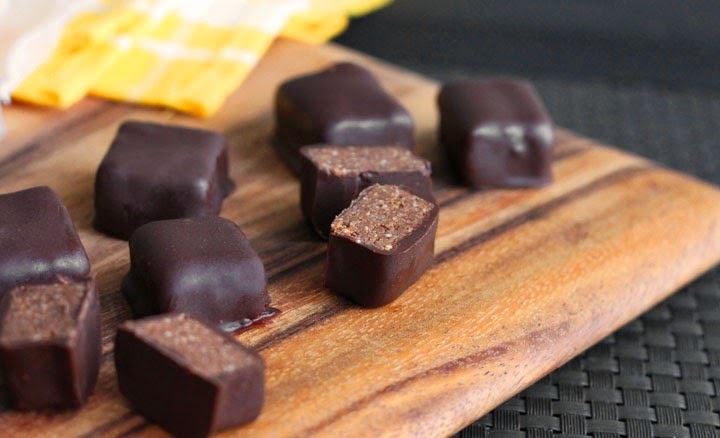 Store chocolates in the fridge in an airtight container. They will keep for weeks!